Google Hangouts on Air offer an easy way to stream live events. The more difficult part is setting up multiple sources for audio and video capture for a better viewer experience. That’s something Chris and I got chance to experiment with recently. 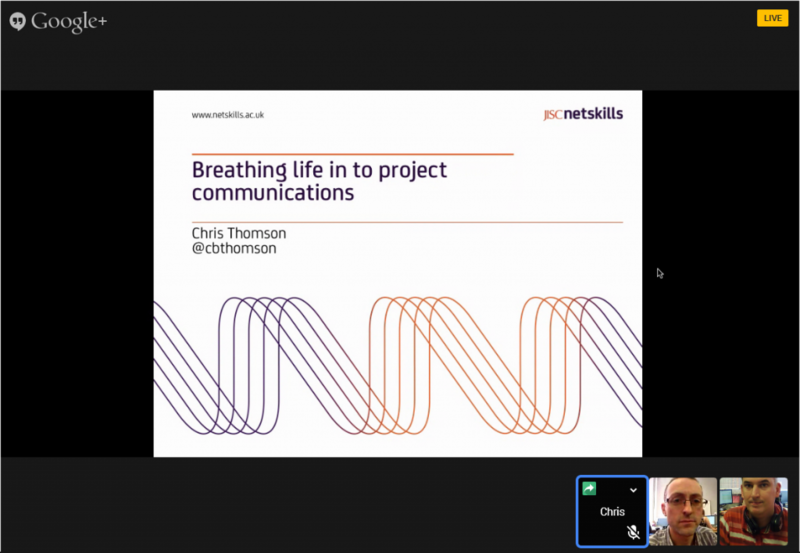 We were asked to stream workshop sessions between a Computing at Schools event at Newcastle University and a parallel conference at Southampton University. 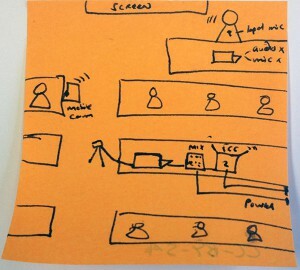 The conference organiser planned to use a laptop with a built-in webacam and mic to stream everything through a hangout. They asked if we could do better and we jumped at the chance. There were two parts to the streaming. The first was a fairly straightforward “play a video of a talk broadcast by Southampton to a room of people in Newcastle.” The second required us to broadcast a workshop back to them and required a more sophisticated setup. This is the one I’m going to focus on here. At the heart of this setup is a laptop to capture all sources, mix them and broadcast the live stream. Given the upload speeds on WiFi can be rather slow, we made sure we had a hard-wired connection to the university network. The speaker would wear a wireless lapel mic to give them freedom to move around without compromising audio quality. We felt people might forgive us if the video quality wasn’t quite 4K, but that the audio needed to be as good as possible. 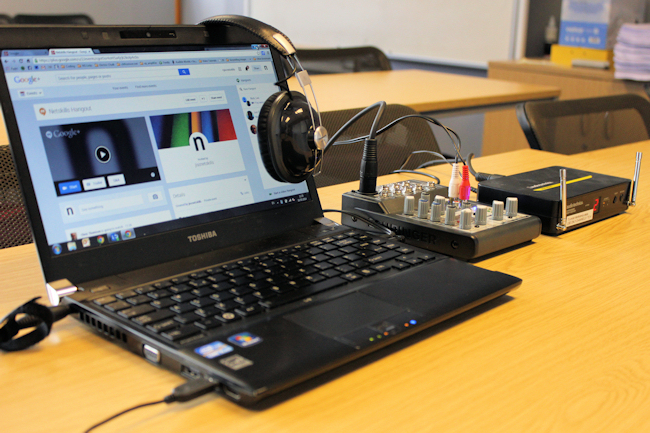 We’d capture the audio via a mixer into the laptop and broadcast it as the audio source. For video of the speaker, we chose to use a webcam on a tripod. Ridiculous as this looked, it would let us pan around if we need to. As to why a webcam, well capturing the signal from this via USB proved far easier than trying to capture from a DSLR. We also wanted the possibility of moving around with a roving camera and microphone to capture workshop activities, audience interaction and questions. We’d do this using a mobile phone connected to WiFi. So, with our sources sorted out, we needed something that would allow us to broadcast them. That’s where Google Hangouts came in. I’d used Google Hangouts in a personal capacity, but not for anything critical like this. So Chris and I set aside an hour to try it out. We spent most of that rather frustrating hour trying to (re)install the Google Talk plugin, which seems to be a big issue if you’ve ever had a previous version installed. With the plugin sorted, we tried out our setup in a Hangout. It worked, but we quickly realised that a hangout didn’t really fit the bill. They’re more for 1-1 and group video collaboration. What we needed were Google Hangouts on Air. Google Hangouts on Air is the adaptation of Hangouts for live broadcast to the web.It allows you to live stream to a YouTube channel (public), to your Google+ page and to a webpage via an embeddable widget. They are also recorded and published to YouTube once they are closed. Using Hangouts on Air is quite straightforward, but we found a few things to be aware of. 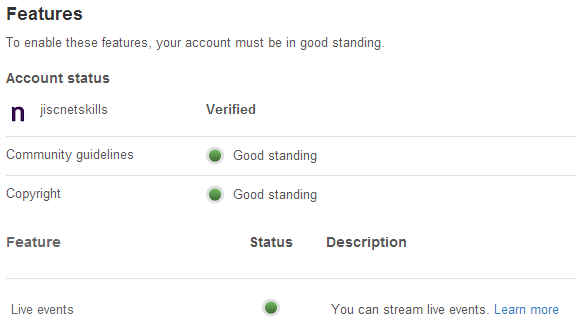 It helps to make sure your YouTube channel is in “Good Standing” and you’ve enabled your channel for live events before the event. 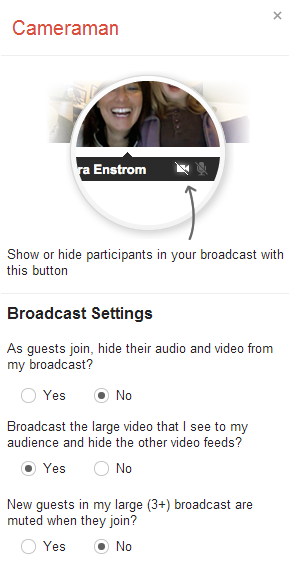 You do this by going to your YouTube Settings > View additional features. Once you start your Hangout on Air, get your input sources sorted. When you are mixing multiple sources of audio and video you need to make sure that you’re broadcasting the right combination. External sources were invited to the hangout as participants. These show as a thumbnail of each source from which you can select which to broadcast. For our setup, we had the speaker’s computer set to screensharing for the slides in PowerPoint (audio and video disabled) and Chris’ mobile as a roaming camera. This allowed us to broadcast the slides most of the time, but to cut to a video of the speaker and audience occasionally to make a more interesting broadcast. The secret to controlling the view that all viewers see is the Cameraman App. It allows you to say “broadcast what I see and hear” (the master mix) so that clicking on different sources affects the view for everyone watching the broadcast. With all that setup (well before the start of the event) we had good quality audio and reasonable video and a URL to send viewers to. They don’t need to know anything about Hangouts or the complexity of the setup behind it, just a browser. One final word of caution. The livestream for viewers via YouTube or video embedded on websites is 30s-1min behind the view you see on the screen of the broadcast computer. Understandable given the rather incredible stuff this is doing between capture and broadcast, but something to watch for if you’re planning on Q&A sessions with remote participants! We’re no strangers to running online events, but this was sufficiently different to justify trying a approach. It is one that we can see being very useful where the mode is more broadcast than collaborate, for which we’d stick with… Collaborate. That is the kit you can see on the image in this post. Other than that, it was just a basic creative HD webcam, an iPhone running the hangout for the roving camera and Google Hangouts on Air to put it all together.